Currently as a group, we have between five to twelve members at any given event, although we can have a fully interactive stand with a single member present. The nature of the hobby allows us to be very flexible in our impression. 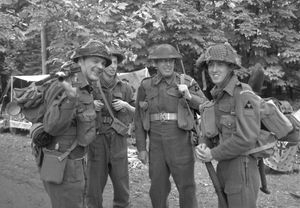 At events where we portray the Royal Warwick Regiment, our main impression, we follow a realistic military structure as it would have been in 1944. At the moment, this takes the shape of a platoon HQ section, led by a Lieutenant, with a Platoon Serjeant and various other members portraying private ranking soldiers which is part of B Company, 2nd Battalion. Our aim is that, when we become a larger group, to portray the rest of the platoon.